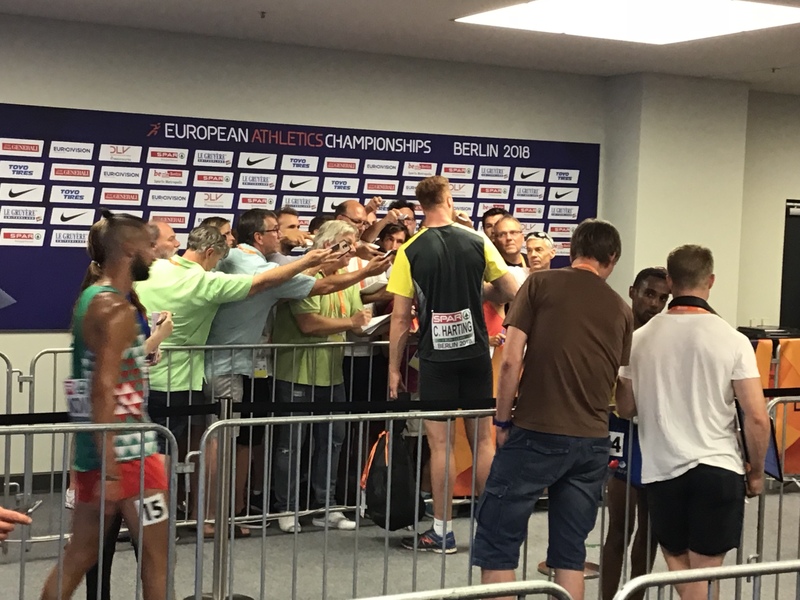 Tuesday morning at the European Athletics Championships featured an embarrassment of riches for throws fans. Two rings full of women shot putters vying for the automatic qualification mark of 17.20m that would advance them to Wednesday’s final. 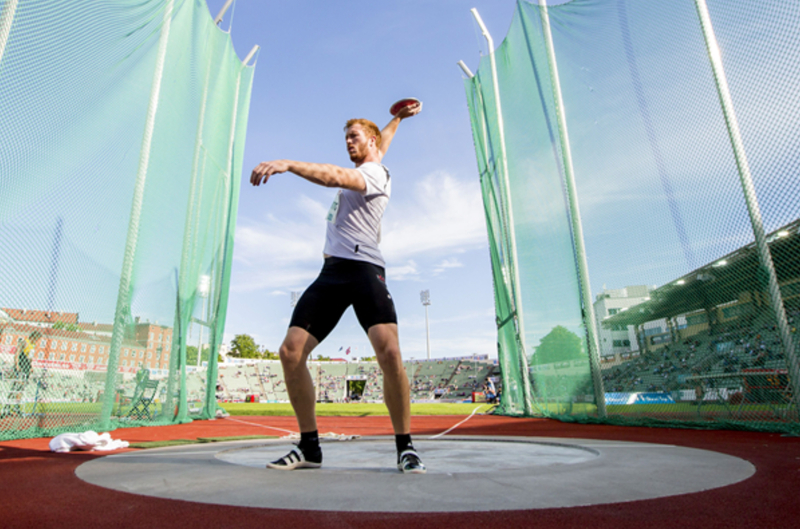 And, running concurrently with the women’s shot, two rounds of men’s discus featuring some of the best throwers in the world, among them 2016 Olympic Champion Chris Harting and 2017 World Champion Andrius Gudzius. The qualification line for the men’s disc was 64.00m, which many of these athletes had thrown in previous competitions. But, as it soon became apparent, 64.00m can seem awfully far if something knocks you off your rhythm. The early hour. The unusually hot conditions (Germany, like much of the rest of Europe, is in the middle of an historic heat wave). An unusually fast or slow throwing surface. Some made qualification look easy. 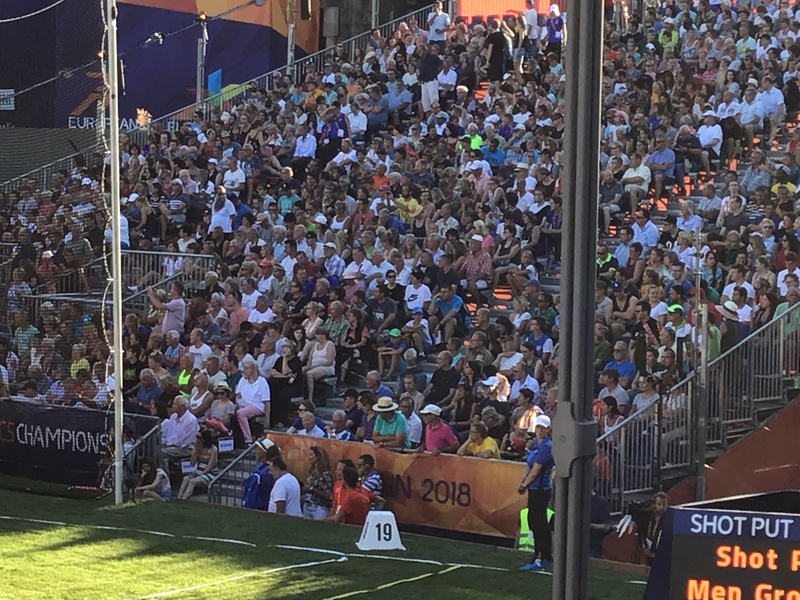 Christina Schwanitz, much to the delight of the crowd (as she is German and the favorite to snag the gold here) went 18.83m on her first attempt. Thank you, and good day. 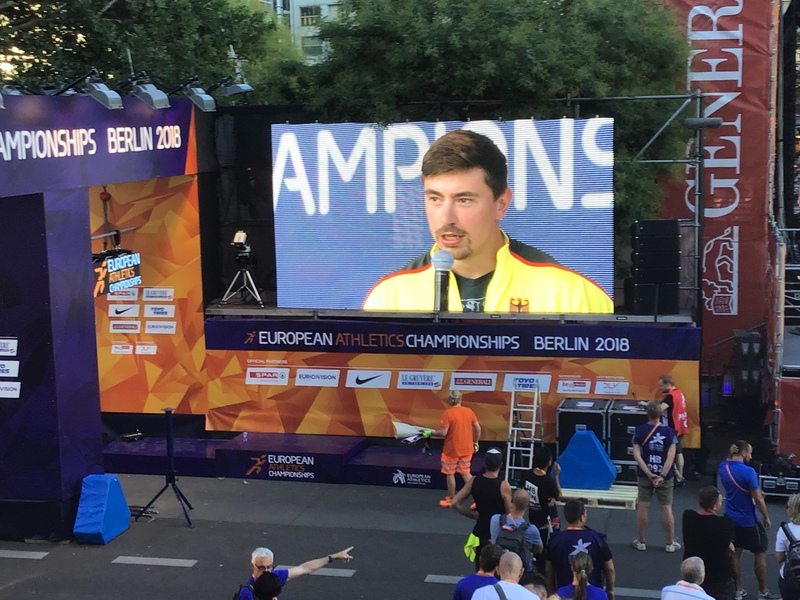 Daniel Stahl, the silver medalist at last year’s World Championships in London, also launched his first throw well past the qualification line (it turned out to be 67.07m) raised his arms in triumph and headed off to rest for Wednesday’s final. On his way out, I asked Daniel if he generally takes something off a first round throw in order to avoid fouling. This approach seems to suit the big man’s personality. Stahl is the kind of guy who, if you were a kid, would be your favorite uncle. Large. Easy going. Always smiling. Not the kind of person whose confidence would be ruined by a first round foul. For some, though, it was not so simple. Poland’s 2015 World Champion Piotr Malachowski would appear to be cut from the same mold as Stahl. He comes across as very even-keeled, and has been through many, many qualification rounds at major competitions. 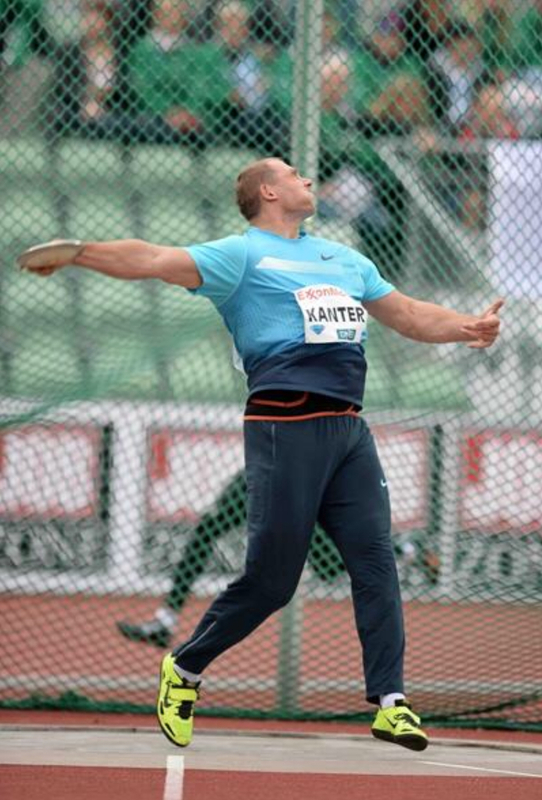 Somehow, though, after warming up at 65.00m, Piotr simply could not find his timing when the throws counted. He walked out on his first attempt (it looked to be about 57.00m), caged his second, and misfired badly on his third, ending up without a mark and without an invitation to the finals. While Piotr was suffering his inexplicable meltdown on one end of the stadium, two young shot putters came away from their first ever qualifcation rounds at a senior international competition smiling and utterly delighted to have made the final. 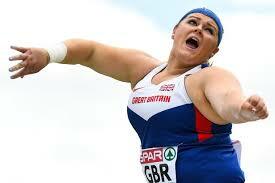 One, British Champion Amelia Strickler, threw a PB of 17.31 on her second attempt. 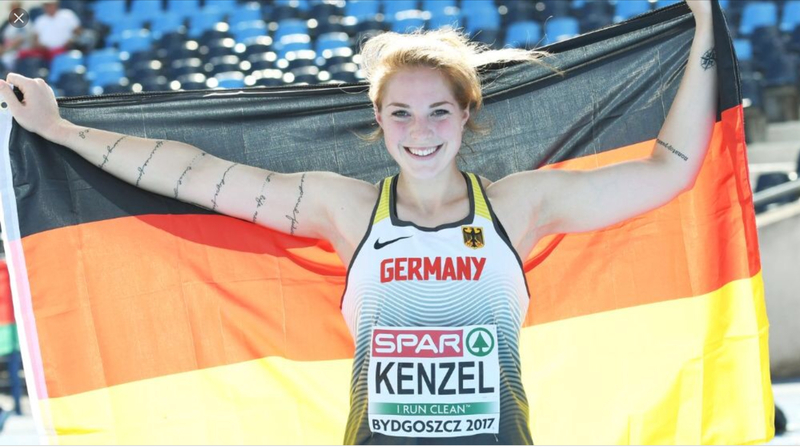 Like Amelia, twenty-year-old Alina Kenzel surpassed the qualifying line on her second attempt. 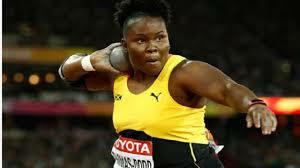 Her throw of 17.46m was the seventh best among qualifiers. Another competitor who seemed just as excited by his success in qualification was the great veteran Gerd Kanter. He threw 64.18m on his first attempt and was positively giddy after. After all the success he’s had, including winning the gold at the Beijing Olympics, Gerd still prepares conscientiously for qualification days. The most surprising moment of this qualification day came when defending Olympic champion Chris Harting failed to advance. 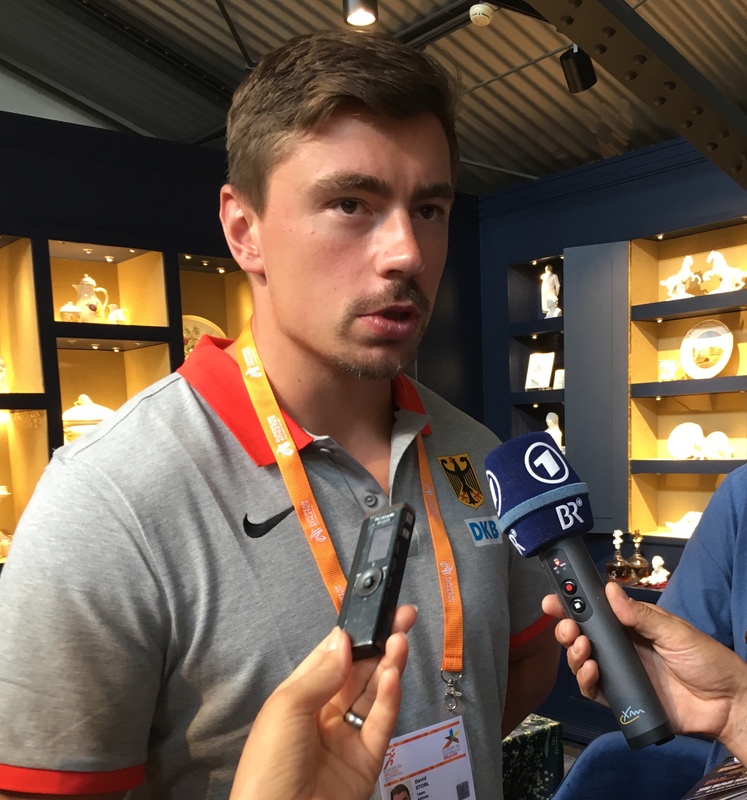 Chris showed that he was in good shape two weeks ago by winning the German Championships with a toss of 66.98m, and most observers would have considered him a candidate to challenge Stahl and Gudzius for the title here, in the city where he lives and trains. But, one chink in Chris’s armor is that his natural release point often sends the discus down the right side of the sector, and depending on the type of the cage, he sometimes has trouble getting off an unimpeded throw. 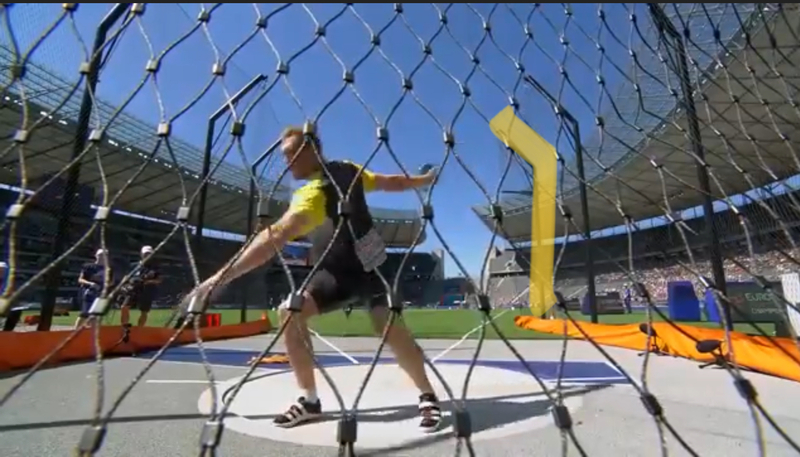 His coach, Torsten Lönnfors, told me later that the type of cage used for this year’s European Championships makes it difficult for Chris to throw in his natural slot because it is shorter than cages normally used in international competitions, with the front support standard jutting out in just the spot where Chris’s throws often travel. Notice the difference between the cage in the photo above at a different competition, and the one below in a photo from yesterday’s qualification round. I highlighted the front standard to make it easier to see. Torsten told me that they had tried (and apparently succeeded) in practice to get Chris comfortable throwing with this type of cage, and in warmups he was able to throw a nice, clean 65.00m toss. But, Olympic champions are humans, too, and maybe once that first competition throw ricocheted off the cage…maybe all of a sudden throwing in your home town with all eyes on you and the music turned loud each time you entered the ring…maybe it just got to be too much. After three throws off the cage resulted in three fouls and a humiliating exit from the competition, Chris had to face a very disappointed German media. Afterwards, he graciously spoke with me for a few moments. Heartbroken, he struggled for words to describe how this had come to pass. There is no NFL-style draft for graduating collegiate throwers, no carnival of excess where the most promising among them are paraded in front of television cameras and offered multi-million dollar deals to join the professional ranks. 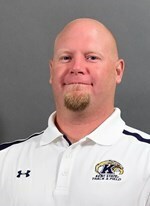 For a college thrower, going pro often means going without–without regular coaching, without regular treatment for injuries, sometimes without regular meals. The challenge is to find a way to stay in the sport long enough to reach your athletic prime. In a recent interview, 2004 Olympic shot put champion Adam Nelson reminisced about living in a closet under a stairwell Harry Potter style during his first year as a pro. Curtis Jensen, currently in his fourth year as a professional, broke twenty-one meters for the first time ever this season while working two and sometimes three jobs to support himself. 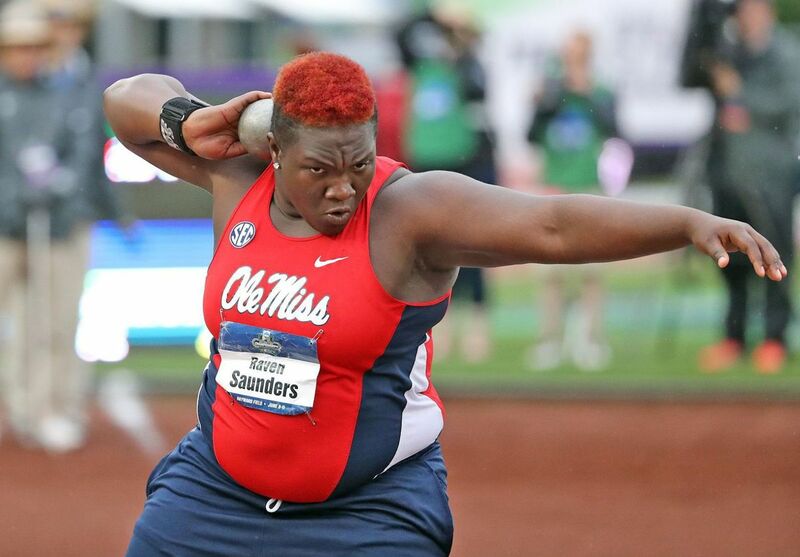 Gwen Berry and Jessica Ramsey, two of the best young throwers in the US, have paid the bills at times by working for a company that bakes and delivers fresh cookies to college students at all hours of the night. So, if it is a glamorous lifestyle you seek, put down that metal ball and start working on your mid-range jumper. I know that other countries have different systems for developing their athletes. 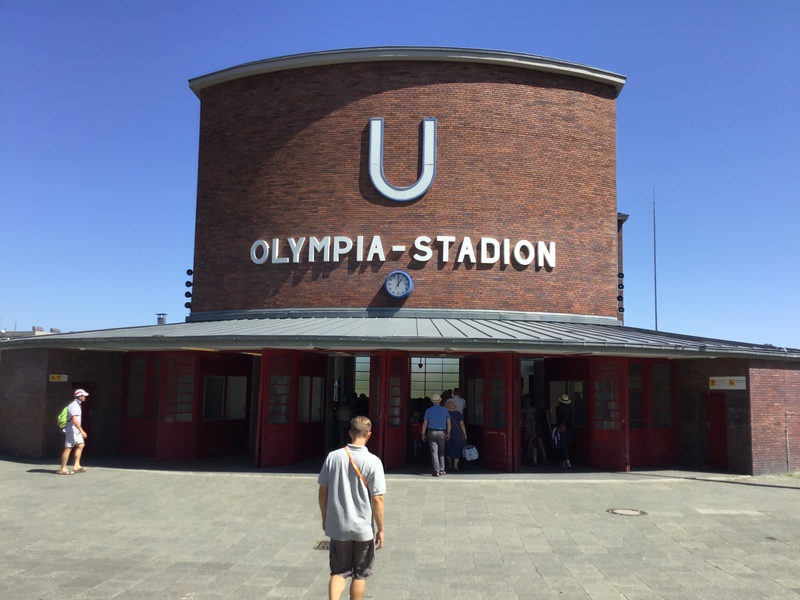 In Germany, for example, the best throwers are offered a chance to enlist in the army or the police force where they receive a salary while training full time for much of the year. I recently had the opportunity to speak with the 2018 British shot put champion Amelia Strickler, and I was curious to find out what life is like for a professional thrower in that country. That’s because Amelia grew up on Ohio, and is a 2017 graduate of Miami of Ohio University. Amelia graduated from high school with a shot put PR of 42’2”. During her freshman year, she upped that to 48’7”. 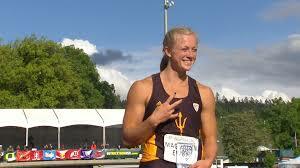 As a junior, she broke the school record with a toss of 55’5 ¾” and finished twelfth at the NCAA Outdoor Championships. A promising senior season was derailed by stress fractures in three different leg bones during the winter of 2015/2016. Amelia ended up taking a medical redshirt, but that summer she competed in the British Championships for the first time. She remained healthy during the 2016/2017 season, her final year at Miami, and managed a PR of 56” (17.12m) but a lousy performance at regionals kept her out of the NCAA finals. With her mother and sister planning a move to England, Amelia jumped the pond for good that summer. She quickly became the second ranked putter in the country and qualified to compete in the European Team Championships. Talking to Amelia, it became obvious that post-collegiate putters in the UK have one significant advantage over their counterparts in the US: the club system. As is commonly the case in European countries, sports in the UK are not affiliated with schools. Rather, various communities sponsor clubs. Though the clubs do not support the athletes financially, they provide something that can be hard to come by in the US: meets. Lots of meets. For post-collegiates in the US, opportunities to compete are not hard to come by during the college season when there are lots of invitationals that allow open entries. But once mid-May rolls around, the NCAA regionals begin the invites end and those not yet accomplished enough to snag spots in Diamond League meets are out of luck for a good chunk of the summer. And forgive me for stating the obvious, but it is awfully hard to get better at your event if you can’t compete regularly. This, too, is likely a byproduct of the club system. So finding competitions is no problem for post-collegiates in the UK, but like their counterparts in the US, they still face daunting challenges in trying to extend their career. Though Amelia is the current British shot put champion, a 17.26m PR and a promising future have not been enough to secure financial support from the British Athletics Federation. She currently lives with her mother, works mornings in a local shop, and commutes two hours by rail every day to a practice facility that she pays to use. She is also on her own in trying to secure top-flight coaching. When she first arrived in the UK, Amelia tried to rely on Steve Manz, her coach at Miami. She regularly sent him practice videos and solicited his advice, but that was clearly not an ideal arrangement. 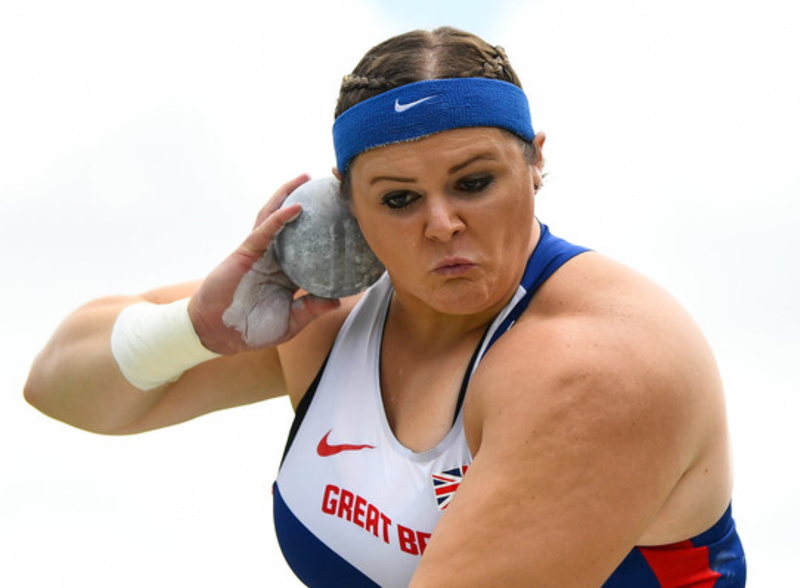 At the 2017 European Team Championships she met former British discus champion Zane Duquemin, who was trying to finance his own throwing career by coaching on the side. She heard good things about Duquemin, who also coaches current British discus champs Jade Lally and Brett Morse, and so began making the two-hour trek to the town of Loughborough to train with him. In spite of a torn calf muscle that interrupted her training this winter, Amelia has had a solid outdoor season. She hit that PR of 17.26m on June 9th, won the British shot title later that month, and represented Britain at the recent World Athletics Cup in London where she greatly enjoyed her first experience competing in a large stadium. Next up for Amelia are the English Championships followed by the European Championships this August in Berlin. Getting sponsored by the British Federation would make life easier going forward. She’d have free access to Federation facilities and physiotherapists. To obtain that sponsorship, though, she is likely to have to break the 18-meter barrier. 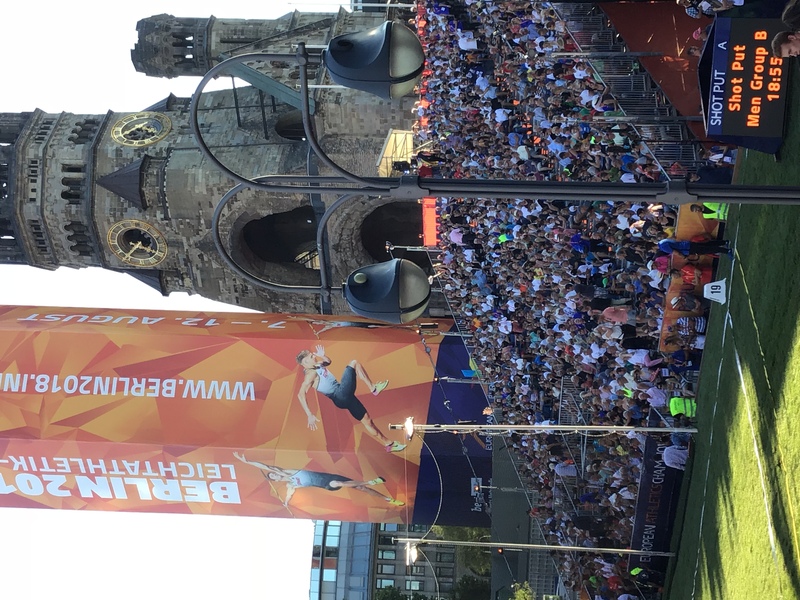 A perfect end to the season would be an 18-meter throw in Berlin followed by an invitation to the Birmingham Diamond League meeting followed by a sponsorship offer from her Federation. That’s a lot to have riding on these next couple of meets, and I wondered if that would make it difficult to stay focused on the task at hand as she stepped into the ring. She will get all the atmosphere she can handle in Berlin, as one of the more charming aspects of German culture is their passion for the throws. 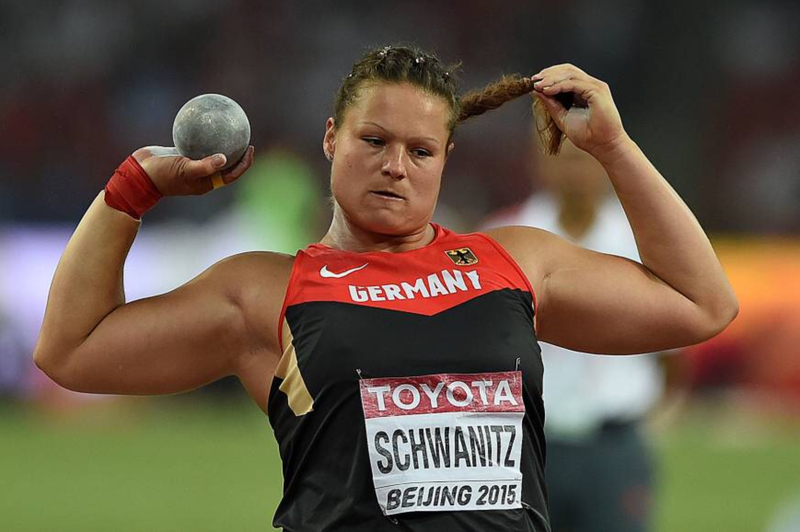 They will show up in force to cheer on 2015 shot put World Champion Christina Schwanitz who, after two injury-plagued years, is back in 20-meter form. 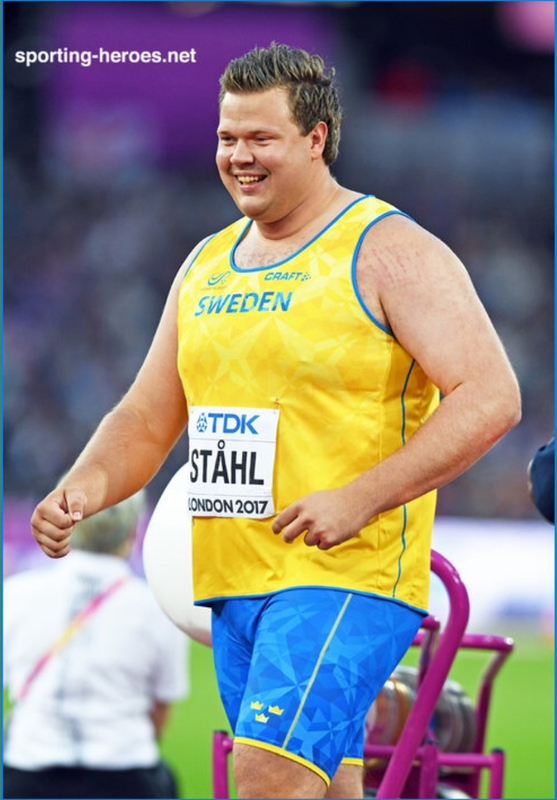 Oh, and running concurrently with the women’s shot, both prelims and finals, will be the men’s discus where one Robert Harting will be making his final appearance…ever. Think that stadium will be rocking? 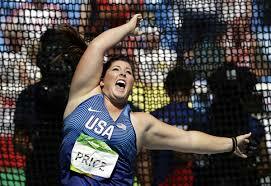 Maybe Amelia will be able to tap into that energy, blast out an 18-meter throw and take a big step forward as a pro. Either way, she’ll be back at the grind this off-season, hopping aboard that Loughborough train day in and day out hoping it will eventually take her to the big time. Remember that moment in Rocky when out of nowhere he decks Apollo Creed in the first round? Nobody in the place thinks he’ll so much as lay a glove on Creed,, and then…Bam!…he lands a haymaker. In the end, Rocky did not win the that fight, but that punch and his ability to hang tough for fifteen rounds against overwhelming odds gave him credibility as an athlete and changed the course of his career and his life. Okay, I know Rocky is a movie. Don’t mistake me for those Game of Thrones fans who can’t wait for time travel to be invented so they can go back and get a look at a dragon. But I witnessed a very Rocky-like moment in real life recently. It occurred, ironically enough, during the first round of the women’s shot at the USATF Championships in Des Moines. As I sat down on that perfect Sunday afternoon to watch flight two warm-up, I anticipated a hard-fought battle between the current NCAA shot put champion Maggie Ewen and the defending USATF champion Raven Saunders. No other thrower seemed likely to break 18 meters, and since Ewen and Saunders were reliable 19-meter throwers, this was clearly going to be a two-person race. It turned out, however, that I’d missed something during warm-ups, a clear sign that a third contestant might just upset the form chart. 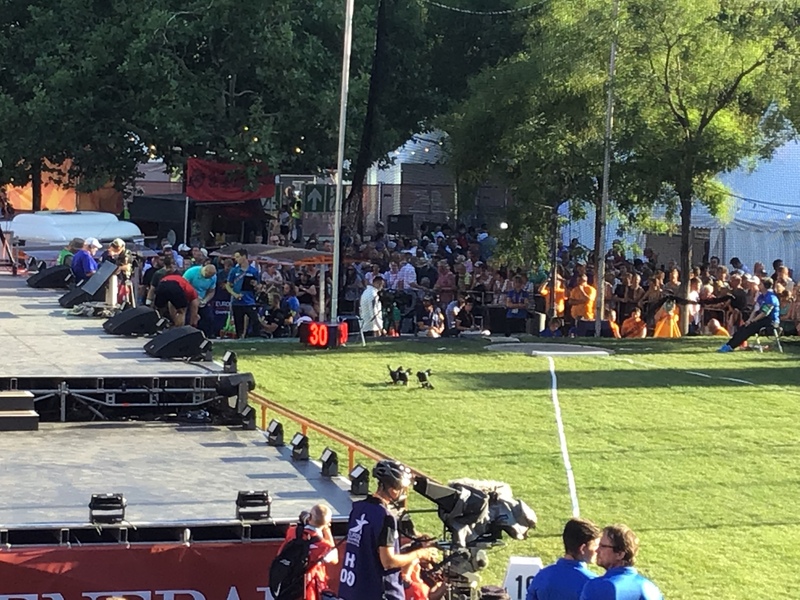 Twenty-six-year-old Jessica Ramsey, who had finished fifth in the hammer competition a day earlier and who came to Des Moines with a lifetime best in the shot of 18.42m, had warmed up with several non-reverse throws, each of which had traveled around 17 meters. As signs go, this was admittedly a subtle one. Nothing in there about fixed-feet fulls. But to two people present in Drake Stadium that day, Ramsey and her coach John Smith, those warm-up throws portended a cosmic shift in the women’s shot. Ramsey strode into the ring on her first throw and absolutely killed one. It was. The throw measured 19.23m. It was a three-foot PR and the seventh best throw in the world this year. In the space of a couple of seconds, Ramsey had gone from an anonymous member of a large group of better-than-average American female shot putters to one of the best in the world at her event. Actually, it took a little longer than a couple of seconds. Ramsey graduated from Western Kentucky University in 2014 having put together a fine college career (seven-time conference champion, all-American in the shot) under a fine college coach (Ashley Muffet, now at Ohio State). Her PRs though (53.84m in the disc, 61.44m in the hammer, and 17.49m in the shot) were not necessarily those of a future world-class thrower. Ewen, by comparison, just graduated from Arizona State having thrown 62.47m in the disc, 74.56m in the hammer, and 19.46m in the shot. 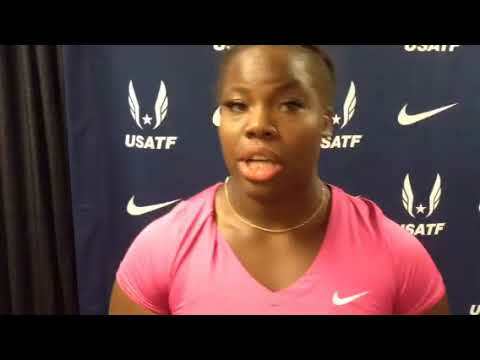 In spite of this, Ramsey was determined to pursue a career in the professional ranks, so she packed her belongings and relocated to Carbondale, Illinois, to train with Smith, at that time the throws coach at Southern Illinois University. After settling in Oxford, Mississippi, Ramsey had to figure out how to support herself while also leaving time to train. In spite of this, under Smith’s tutelage Ramsey kept improving in the hammer and the shot. 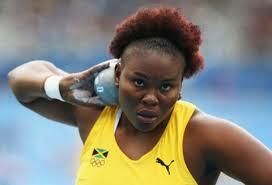 As a glide shot putter, Ramsey could not have found a better, more experienced coach than Smith. Many years ago, Smith developed a reputation as the best glide shot coach in the United States. He honed his skills at teaching the glide while guiding Connie to a long and remarkably successful career that began in the 1980’s when winning international medals meant beating the Commies, and lasted until the early 2000’s by which time the fall of the Eastern Bloc and the advent of stricter drug testing protocols had significantly altered the nature of the sport. Throughout most of Connie’s career, all evidence indicated that the glide technique was the most reliable path for a female shot putter to win a medal at a major championship. 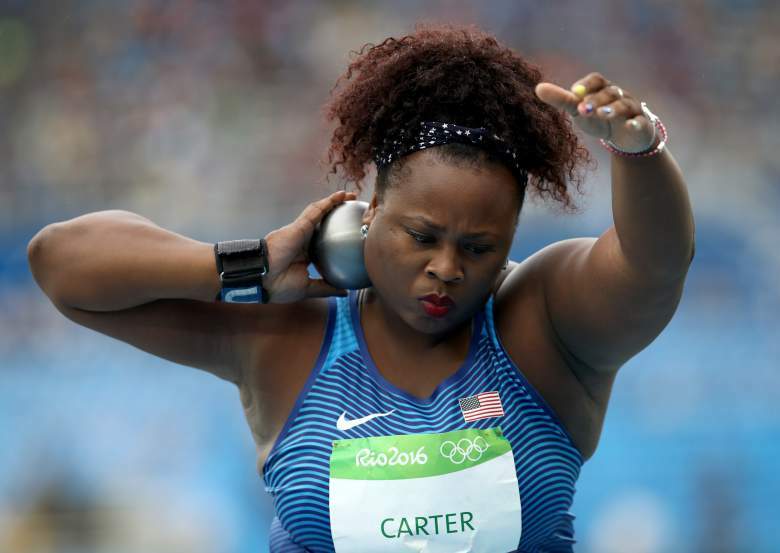 It was not until Jill Camarena-Williams nabbed bronze at the 2011 Worlds that a rotational shot putter broke through. Prior to that, every World and Olympic medal awarded in the women’s shot had been won by a glider. But the increasing success of the rotational technique among the men (including a sweep of shot medals at the 2000 Olympics) caused Smith to believe that women could benefit from adopting the rotational technique as well. In March of 2014, shortly before Ramsey joined his training group, Smith posted an article in which he made a compelling case that it was time for female putters to abandon the glide. So Ramsey was in for a bit of a surprise when she arrived in Oxford. Smith wanted to convert her to the spin. She did not give in easily. Complicating matters was the fact that over her first two seasons with Smith, Ramsey pushed her glide PR into the 18-meter range. But Smith still felt that she was wasting her potential. Matters came to a head at the 2016 Olympic Trials. Over many years of careful observation, Smith came to believe that gliders and non-reverse discus throwers shared a quality that was often missing from the technique of rotational putters: a strong connection with the ground. As he saw it, discus throwers and rotational putters who focused too much on getting air time–whether during the non-support phase or as they launched the implement from the power position–were sacrificing distance and reliability. Long story short, Smith made Ramsey take a whole lotta fixed-feet throws over the past year. She didn’t come close to 19 meters again (her series went 19.23m, 17.65m, 17.61m, F, 18.24m, F), and she didn’t win (Ewen passed her in round five with a toss of 19.29m) but that one throw was enough to get her an invitation to her first Diamond League meeting (in Rabat on July 13th) and perhaps usher in further life changes that will make staying in the upper echelon of putters a bit easier than getting there in the first place. A strong showing in Rabat could get her invited to the Diamond League meeting in Monaco on July 19th. 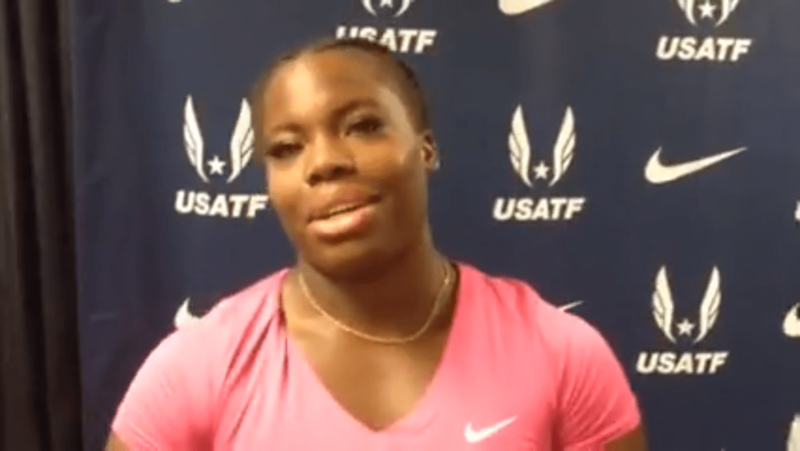 She is also scheduled to compete at the NACAC Championships in Toronto in early August. If she finishes the year with a top-ten world ranking, Ramsey will likely qualify for the USATF tier system, which will allow her to have health insurance for the first time since leaving college. Additionally, Ramsey hopes to soon be sponsored by the New York Athletic Club. Should that happen, she would be able to cut down to working only one job and have more time to recover from her daily training sessions. Owing to the brutal financial calculus of the sport of track and field, Ramsey’s performance in this next handful of meets may determine whether or not her days of averaging five hours of sleep, of trying to get by on $300-$400 dollars worth of food per month, or praying that she doesn’t sustain an injury for which she cannot afford treatment, are over. Either way, Ramsey is committed to continuing her journey.